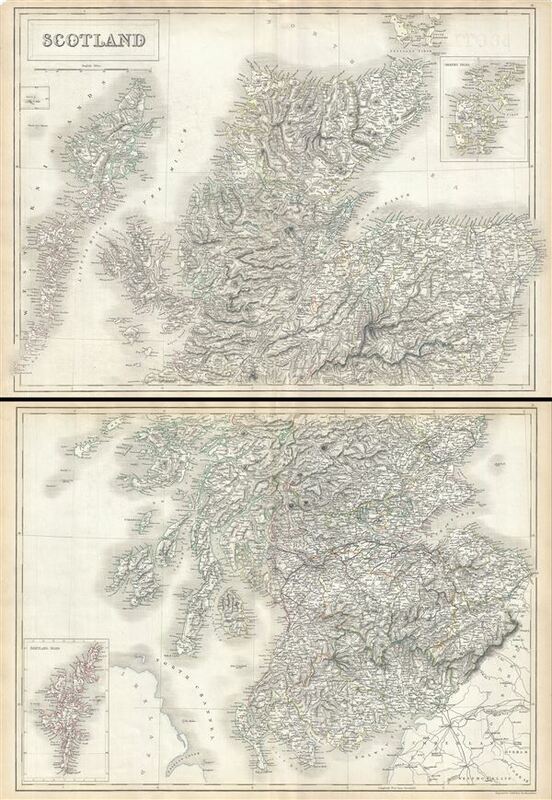 This is a fine example of Adam and Charles Black's 1844 map of Scotland. Divided into two separate maps, the upper map depicts northern Scotland from Blair Athol to the Island of Hoy (part of the Orkney Islands) in the north. An inset map on the upper right quadrant details the Orkney Islands and another inset near the left margin features St. Kilda. The lower map represents southern Scotland and covers from Coll Island to the Mull of Galloway. The lower left quadrant of this map features the Shetland Isles. Throughout, various towns, cities, roads, rivers, mountains and several other topographical details are noted with relief rendered by hachure. This map was issued in the midst of Scotland's Industrial Revolution, in which it emerged as a regional center for engineering and shipbuilding. In 1843, against the backdrop of the Industrial Revolution, during which Scotland flourished, the Church of Scotland witnessed a division in which many of its ministers, following a decade long conflict, broke away to form the Free Church of Scotland. Both maps were engraved by Sidney Hall and issued as plate nos. IX and X for the 1844 edition of Black's General Atlas. Black, A. and C., Black's General Atlas (Edinburgh), 1844. Black's General Atlas was a popular Scottish atlas of the world issued by the Edinburgh firm of Adam and Charles Black. This atlas was first issued in 1840 with subsequent editions being printed well into the 1890s. While most editions were printed in Edinburgh, an American edition was issued in 1857. Most early editions of his atlas were engraved by S. Hall. Typically this refers to Sidney Hall, who died in 1831, but in this case, since the engraving was initiated well after his death, it was most likely his widow, Selina Hall, who did the engraving. Later editions feature additional maps updated and engraved by William Hughes. Early editions featured outline color only, but later editions embraced a full color approach with pale green, yellow, and blue pastels. All editions are known for their meticulous presentation of the most up-to-date cartographic information. Moreover, this exceptionally long publication run provides a fine cartographic record of the middle to late 19th century - particularly as regards the complex cartographic evolution of the Americas through this period. Very good. Set of two maps. Original platemark visible. Blank on verso. Minor wear along original centerfold. Rumsey 2305.017, 2305.018, 2305.019 (1854 edition). Philips (atlases) 4334.